This is what I told my fellow patients, my therapist, and anyone else who would listen in the psychiatric hospital this summer. I wasn't really kidding. My kids were spending a good bit of time at a friend’s house where kittens were in high numbers and they were enamored, but not as much as I. Sitting on my friend’s couch in those stressful weeks leading up to the panic attacks and hospitalization, I felt the old familiar calm sweep over me as I nuzzled a snowy white ball of fluff who purred and clawed against my chest. My last night in the hospital I sat talking with my husband via an old black phone with the classic silver cord and buttons –like something straight out of a 1980's phone booth. “You’re never going to guess what I saw tonight,” he said. It was late August and after tucking the kids into bed, he noticed a small animal scurrying across the kitchen toward the laundry room and back door. At first he thought it was a squirrel, but following slowly he realized it was a small, gray kitten. Then the little scamp was off and running out the same open door he crept in, disappearing into the dark night. It seemed like a sign, a good omen, that little gray visitor padding in quietly like fog in the middle of a dark night. He never showed up again, though my husband called and left food by the back door. The following day, after my discharge, we drove to pick up our kids. They piled out of my friend’s house, tumbling and climbing on me like love-sick puppies. On our way out to the van they showed me another pair of kittens who’d shown up during my hospitalization, two more strays. Are you surprised that when my friend called the next day to see if we wanted the kittens, I said yes? She delivered them herself, like one delivers soup to the sick and we drank them in as the stress and worry of weeks slowly worked its way out of our family system. 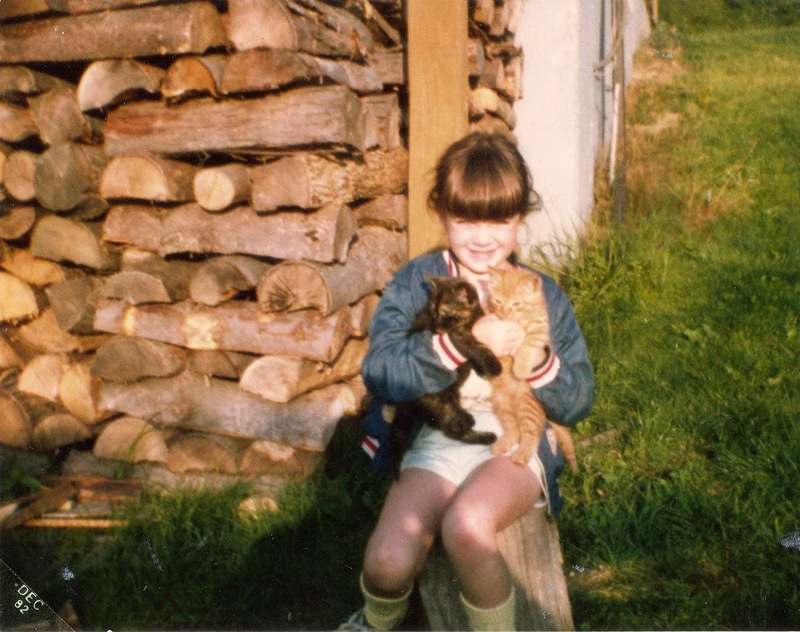 I always had a cat as a little girl, always. I used to list them by name to impress and wow friends with tales of their adventures and unfortunate demises. We had indoor-outdoor cats and they all, invariably, slept in my bed. They were my babies, my companions. I mothered them before I knew what mothering was. Their calmness and acceptance of my quiet, slow ways nurtured me before I even knew I needed nurturing. I have a picture of me as a little girl holding some of our first kittens. In it, I am sitting on the stump of a log with one cat tucked under each arm, squinting into the sun. Thinking about it now, it occurs to me how many pictures we have of me holding the twins in a similar position - one on each side, two lovable lumps of little boy. Both, the kittens and the twins, opened me, opened my heart, my body, to love. Both brought healing and resurrection in their own mysterious ways. We got two kittens this summer when it didn’t make sense and brought them into our chaotic home, our anxious hearts. Soon evenings in front of the TV included a pile of kittens in my lap. Cooking dinner was not complete without someone climbing up my pant-leg to beg or riding tucked into the front of my hoodie, a little furry face peaking out, a soft purr humming against my heart. They're our children’s pets, but no one seems to need them as much as I do and my children, in their intuitive wisdom, seem to know this too. Every day, multiple times a day, they find a cat and, carrying it through the house, present it to me like an offering. “Special delivery,” they say, lifting the cat toward my waiting arms. With open, outstretched arms I welcome them, drinking in again their sweet, unexpected grace. Are you a cat lover, a dog lover, a wild ferret lover? Tell me about it, I'd love to hear how animals bring healing in your life. Precious post, Kelly! I have always had a cat throughout my entire life and they have been God's healing balm to me in many times of need. Curling up on the couch, they instinctively know I need their healing touch and purrrr. I had one cat, who loved to lick my tears as they fell. Always made me think of God gathering them into little bottles. Precious to Him. May the Lord continue to bless you with insight and healing of your heart and emotions. Be ye at peace, milady . . . visiting from Jennifer Dukes Lee's place and glad I dropped by . . . Thanks for commenting Kathy. It's so sweet to open our hearts to the gifts of God's creation. I grew up with litters of kittens and can definitely relate to this post! However, as an adult I have been drawn to dogs. Our dog Hazel is a god-send. We've had her for 2+ years and I believe God sent her to be our therapy dog and comfort us on hard days. I've been thinking recently about how many pets are on anxiety meds these days. I wonder if it's in part because they have such anxious owners. So glad you have your therapy dog :) Thanks for commenting. Love this, Kelly. So glad you found kittens again, just exactly when you needed them most.